This April marks the 20th commemoration of the genocide in Rwanda -- where we both trace our roots. As we take time this month to remember the events of 1994, honour the lives lost, and reaffirm our commitment to never again stand by and let another genocide take place, a troubling situation is unfolding in Burundi that appears frighteningly reminiscent of Rwanda pre-1994. As some of you many know, this April marks the 20th commemoration of the genocide in Rwanda -- where we both trace our roots. As we take time this month to remember the events of 1994, honour the lives lost, and reaffirm our commitment to never again stand by and let another genocide take place, a troubling situation is unfolding in Burundi -- right next-door to Rwanda -- that appears frighteningly reminiscent of Rwanda pre-1994. The escalating tensions in Burundi threaten not only those within its borders, but the safety of the rest of the great lakes region as well. Particularly in light of this 20th commemoration of the Rwandan genocide, we hope to increase awareness about the current situation in Burundi, as a growing number of reports suggest that another genocide could take place if the international community does not monitor events closely. 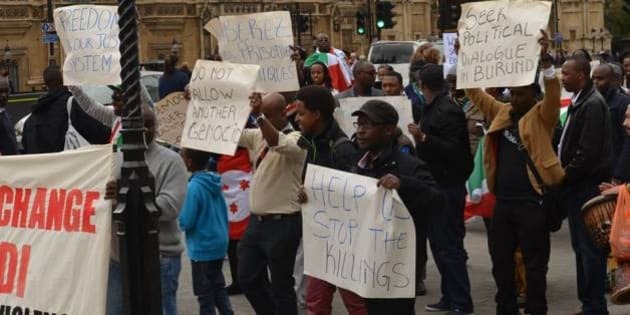 Burundi has a history of ethnic violence predominantly between the two main ethnic groups in the country, the Hutus and the Tutsi, where each group has committed crimes against the other in the past. Tensions have increased since March 8, 2014 when a group of youth from the MSD (Movement for Solidarity and Democracy), one of the political opposition parties, were arrested during a rally in front of their party headquarters. Police used excessive force against the unarmed MSD youths, badly injuring 21 protesters. In total, 79 MSD supporters were arrested at the protest with 48 sentenced to life in prison. Additionally, several high dignitaries from Burundi have been forced into hiding including Vice-Presidents Bernard Busokoza and Térence Sinunguruza (Burundi has two Vice-Presidents) who voiced concerns over recent constitutional amendments and went into hiding after being removed from office. MSD leader, Alexis Sinduhije, is also reportedly in hiding. Current unrest also stems from President, Pierre Nkurunziza's, recent attempt to remain in power beyond the terms determined by the constitution of Burundi and the Arusha Peace and Reconciliation Agreement (August 2000) -- an agreement that was initially negotiated by the late President Nelson Mandela and later signed by all the political parties in Burundi agreeing to a power-sharing government. A recent attempt by the President to change the Constitution on 21st March 2014 in order to run for a third term failed by Parliamentary vote. The President, however, claims that his first term was only a transitional mandate and that he is therefore still entitled to run for another term in office next year. His government has promised to turn the question of running for another term over to a public referendum. Meanwhile, the UN Security Counsel has alleged that the Ruling Party, CNDD-FDD, has been arming its youth wing, called "Imbonerakure" -- which numbers over 50,000 according to The Economist -- and is preparing them to use force and arms against opposition and in particular towards the Tutsi minority. President Nkurunziza's government vehemently denies these allegations. If true, however, this scenario would appear alarmingly similar to the strategy employed by genocide organizers in Rwanda over 20 years ago. Beyond Burundi, many believe that a conflict in Burundi could lead to violence in Rwanda where a similar history of tensions exist along ethnic lines. Burundi and Rwanda are closely related nations; the bordering nations are inhabited by the same ethnic groups (Hutus, Tutsis and Twa), and have very similar languages. The political and military histories of Rwanda and Burundi are also closely related, as many conflicts in the respective countries since the late 1950s have echoed across each other's borders, often causing damaging effects. Burundi's recent history has been largely absent from mainstream Canadian media, often hidden in the shadow cast by the genocide in Rwanda. The 12-year civil war in Burundi ended only recently, in 2005, after claiming an estimated 300,000 lives and sending a million more into exile. Since then, the country continues to be plagued by a range of social and economic problems. Grave concern for the country's security recently prompted one Burundian pastor with ties to Vancouver to reach out to media here in Canada. In an interview with Vancouver's News1130, the man (who asked that his name not be used in that interview for safety reasons) said, "The past wounds, which had not healed yet, seem to be opening again." Despite gaining refugee status in Canada, this Burundian pastor has chosen to stay in his home country to help the people there, even as conditions seem increasingly dangerous. The situation in Burundi remains largely ignored by the Canadian media, perhaps due to guilt felt by the West for failing to act and stop the Rwandan genocide, but this April our hope is that the tragedy of 1994 will be remembered not only in thought but also through action; namely increased monitoring of the current situation in Burundi, which most reports describe as the worst climate socially and politically since the civil ended in 2005. With prayers for peace and safety in Burundi, Rwanda, and all over the great lakes region.